Self-catering company Hoseasons, famed for its boating breaks across the UK, is reporting strong interest in canal holidays as people flock to the water to make the most of the heatwave. Bookings on the canals are up 39% over the last week compared to the same period in 2017. The majority of departure dates are for July and August, showing that holidaymakers are set to enjoy the summer holidays on Britain’s canals. The news comes after The Canal and River Trust announced it may have to close a 55-mile stretch of water along the Leeds and Liverpool Canal unless there is significant rainfall. The closure is set to commence from July 30 and continue throughout August. Simon Altham, from Hoseasons wants to reassure holidaymakers that Britain’s canals are very much open for business and offer a holiday experience like no other. Meander peacefully through the heart of one of Britain’s most beautiful cities as part of a canal boat break to Bath and the surrounding Wiltshire countryside. Novices will be taught everything they need to know before setting off on a route that takes in the only place in the UK where you can bathe in naturally hot spa water and visit original Roman-style baths. You’ll need to take the rite of passage that is the Caen Hill Locks, one of the longest continuous flights of locks in the country, but you’ll be rewarded or your effort when you arrive in Bath and take a soak in the Thermae Spa. Famed for its Georgian crescents and museums there’s plenty to explore on dry land but if you want to stay on the water head over the impressive Dundas and Avoncliff Aqueducts to the pretty market town of Bradford-on-Avon. A one-week break for 6 people, on Tulip canal boat in August costs from £1651. hoseasons.co.uk or 0345 498 6130. 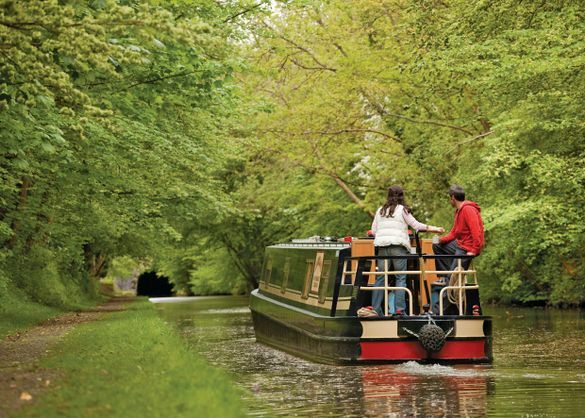 Explore the heart of rural Warwickshire as part of a luxury canal boat break along the beautiful inland waterways of the Oxford and South Midlands canal network. With an excellent choice of routes, there are plenty of chances for the whole family to get involved as skipper. There’s shops, bars and restaurants to enjoy as you meander from Rugby towards Braunston. The bustling canal-side village is home to the hilltop church of All Saints’, also known as the Cathedral of the Canals, a sight not to be missed. Continue to Fenny Compton where you’ll find sites such as Farnborough Hall and The British Motor Museum a short distance away. A 4-night break for 5 people, on Little pea canal boat in August costs from £860. hoseasons.co.uk or 0345 498 6130. Get the best of countryside and culture on a canal boat break to Chester along the Trent and Mersey and Shropshire Union canals. From your base in Congleton you’ll pass through Middlewich, taking on the Wheelock flight of 26 locks before arriving at the town famed for its Folk and Boat festival. Beeston will be your next stop along the way, cruising up the Shropshire Union canal, don’t miss the spectacular view of Beeston Castle as you pass. Finally, you’ll reach your destination in Chester where you can stop overnight in the heart of the city, under the famous roman walls. History buffs can discover the roman amphitheatre or scale Chester Cathedral tower while families may prefer a tour of the Zoo or the challenge of a real-life escape room. A one-week break for 2 people, on a Wedgewood canal boat in August costs from £1484. hoseasons.co.uk or 0345 498 6130.